If your house is anything like mine there are stacks of old kid’s artwork lying around. Frame it, photograph it, have it printed on coaster?? 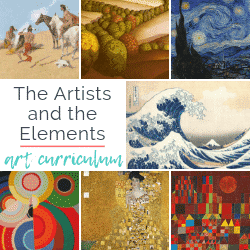 There is no end to ways to commemorate your kiddos creativity but I love using it to make new artwork! 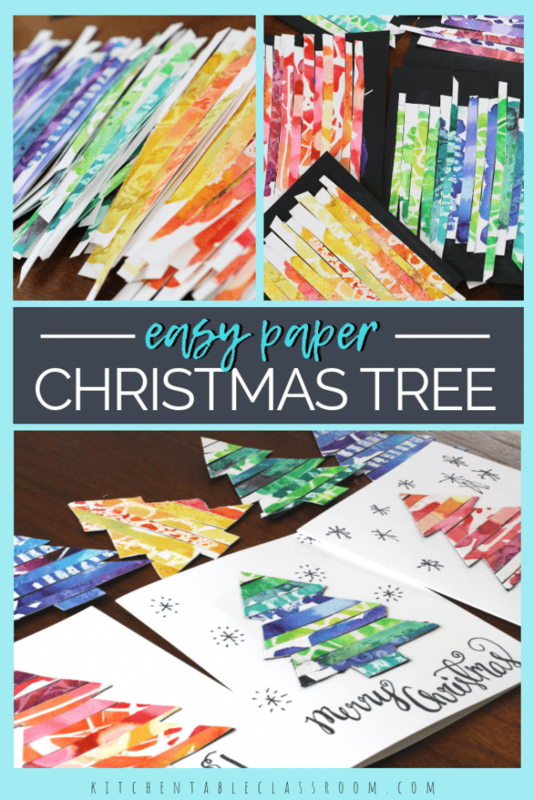 Use old art work or any colorful paper to create this paper Christmas tree craft perfect for holiday cards! The paper in the photos below is samples from a variety of watercolor techniques. 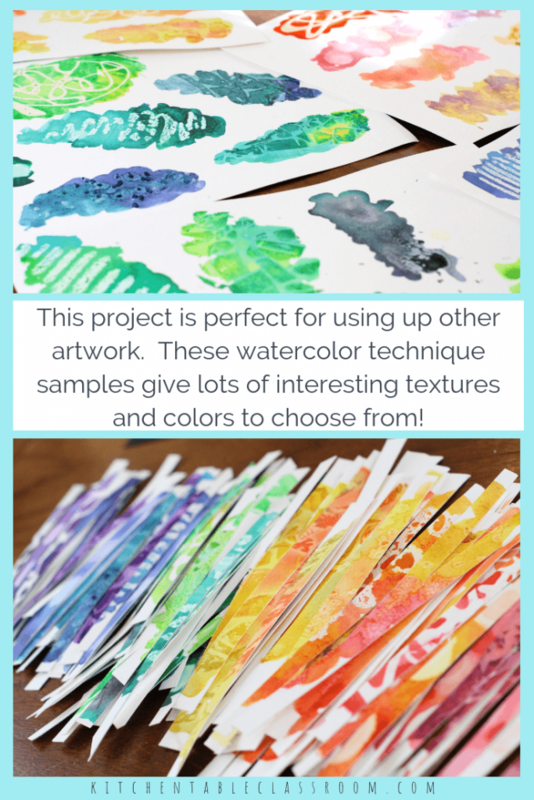 These techniques use household materials combined with plain old cake watercolors and they’re perfect to try with kids of any age. Find them in this post. I love tying in a more loose process or technique oriented portion to a project that could otherwise get lengthy on following directions. 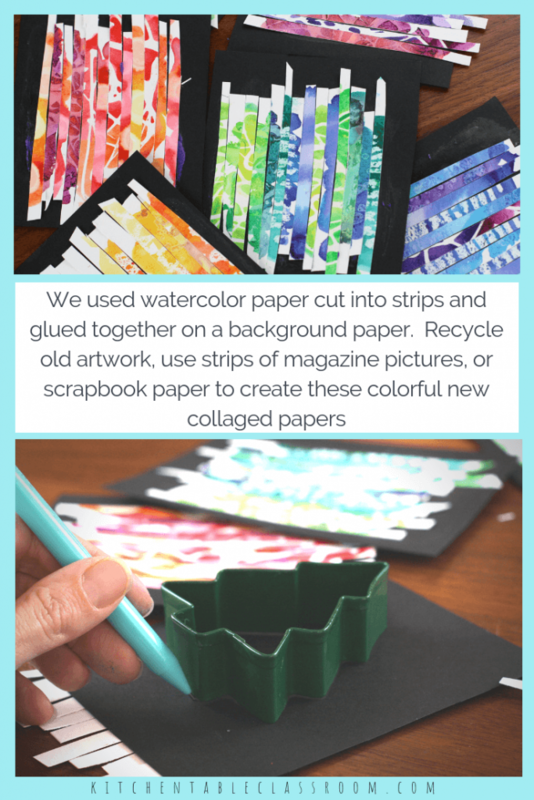 If you already have piles of pretty papers that your kiddos are willing to part with- use those! If you don’t have original artwork you can use magazine pages, scrapbook paper, wrapping paper, old mape pages, anything that brings color and interest! If your students are mid- elementary age or older let them do this work! Use scissors to cut the strios, multiple layers at a time, and settle for approximate! EVen if strips are not precise and even the end result will still be colorful and amazing! Grab a piece of paper, black, white, or whatever your little artist chooses. Use a fat glue stick to glue down strips next to each other, as close as they fit. Let these new recycled papers under a heavy book and give them a few hours to dry. Cutting through globs of glue or not quite stuck papers is a recipe for frustration! Full disclosure here… This pretty recycled paper craft certainly doesn’t have to be a Christmas tree. Choose any subject but it needs to be a bold, simple shape. An easy way to get such a simple shape is to grab a cookie cutter and trace it. Trace it on the “back” of the paper so there’s no tracing over one hundred little strips. And when the cutting out is done there won’t be any stray pencil marks! While the cutting and gluing of recycled strips can take a while it will make enough paper to make a lot of cut outs. 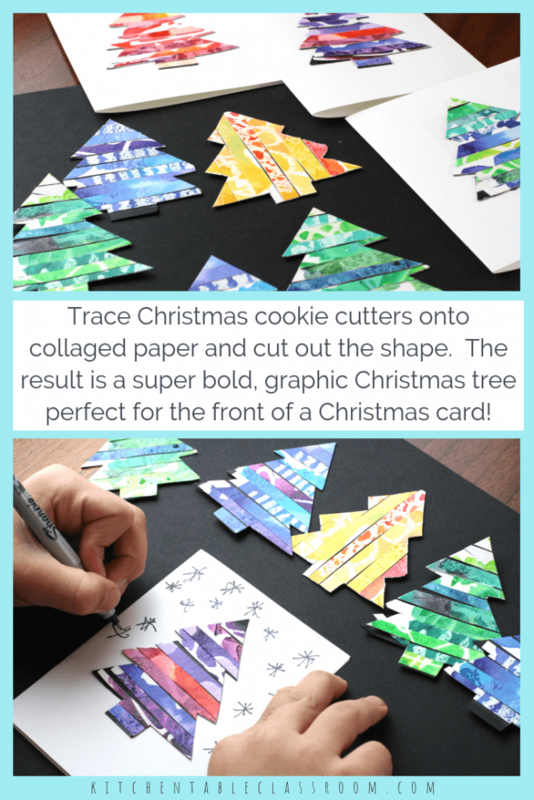 Use scissors to cut your paper Christmas tree out and mount it on a blank note card or paper of your choice! 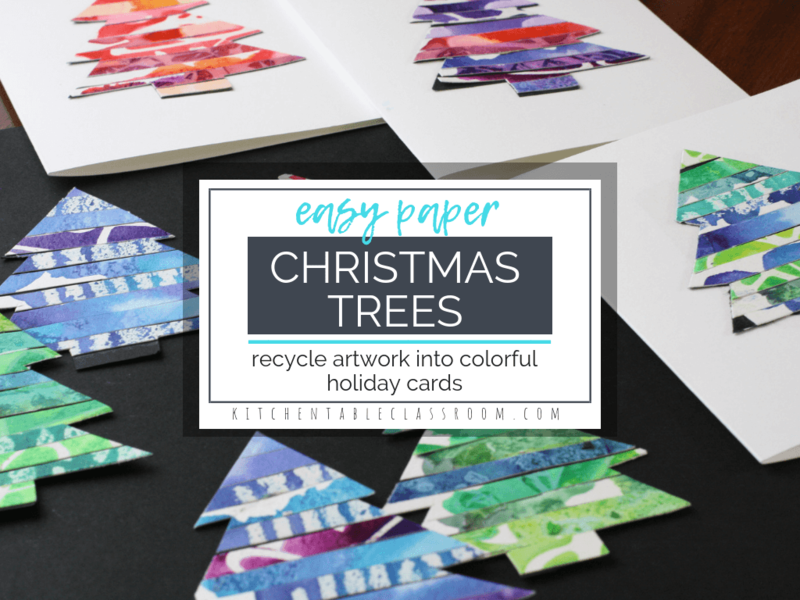 This recycled paper Christmas tree craft is a super fun way to create a lot of super bright, personal Christmas cards in just a few minutes! Personalize your handmade Christmas tree cards…. Toss out some fine point Sharpies and use those paper Christmas trees as a jumping off point for a bit more personalization. Add decorations, stars, or pretty lettering! If you’re looking for more ways to work a little writing into the holiday season check out this free printable Christmas journal. It’s such a sweet way to remember those little moments! If you and your kids enjoyed this paper Christmas tree craft please share it on your favorite social media channel! Those shares help me to bring you more free printable resources and fun projects like this!